PAWTUCKET, R.I. -- Travis Shaw had a breakout campaign of sorts in 2012 when he hit .287/.397/.517 and 19 home runs, spending most of the year with High A Salem. 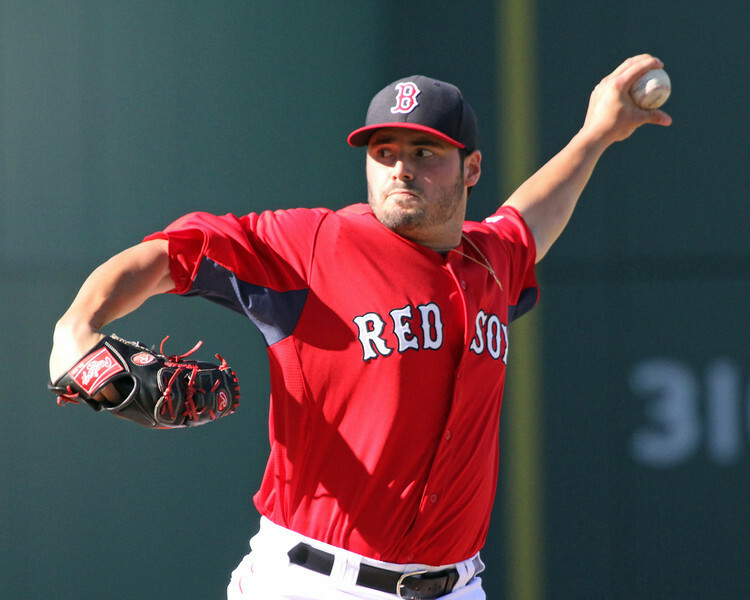 However, 2013 was a step backwards, as he scuffled while adjusting to Double-A. 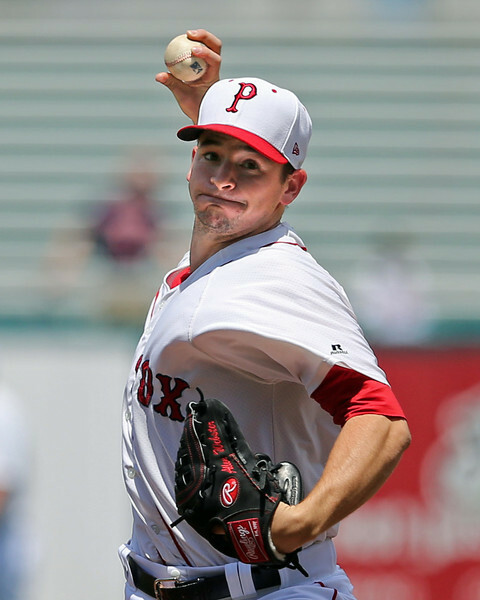 But looking back now after righting the ship in 2014 season and fresh off of a promotion to Triple-A Pawtucket, Shaw says that his 2013 struggles were not the result of being in over his head against Double-A pitching. Instead, he feels that upon initial struggles adjusting to the level, he abandoned the approach at the plate that had proved itself to work earlier in his career. 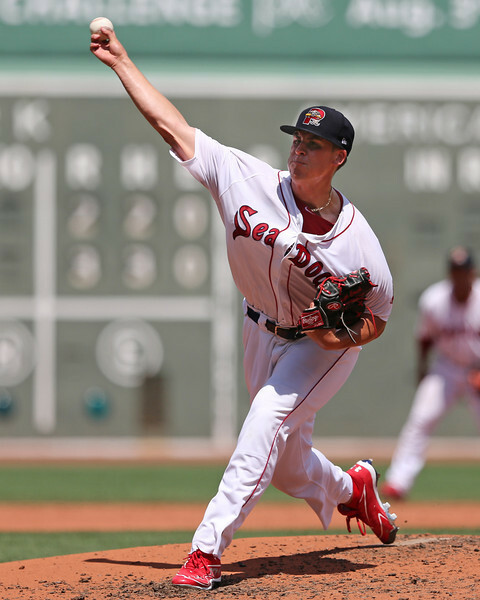 5/30 Cup of Coffee: The highlight of the day came out of Portland, where the Sea Dogs prevailed behind an excellent outing from Henry Owens (pictured). Pawtucket fell after its pitching staff was shuffled, while Greenville could not come up with the big hit. Salem's contest was rained out. Pawtucket fell 6-3 to the Gwinnett Braves (ATL), though the biggest story was who did not appear in the game. Scheduled starter Rubby De La Rosa was scratched, and it was announced he would get the start for the major league club on Saturday. Jeremy Kehrt filled in admirably, allowing a run on four hits in five innings, striking out four without issuing a walk. Despite the solid outing, Kehrt fell to 0-4 on the season. Jose Valdez allowed four runs (three earned), including a three-run homer in the seventh, in his two innings of work. Chris Resop also surrendered a solo home run, striking out three and walking two in his two frames. The bats were largely held in check by a trio of Braves arms, including former PawSox Zach Stewart and Pedro Beato. Garin Cecchini broke up the shutout bid with a bases-loaded double in the eighth inning. It was the first extra-base hit by Cecchini since May 7. Shannon Wilkerson and Justin Henry had two hits apiece for Pawtucket. 5/29 Cup of Coffee: PawSox prevailed while Portland dropped both halves of a doubleheader. A late rally propelled Greenville while Salem's late-inning comeback attempt fell short. Led by a strong performance from starting pitcher Chris Hernandez (Pictured), the PawSox downed the Gwinnett Braves (ATL) Wednesday by a score of 3-0. The left-hander, who moved to 2-5 on the season with the win, struck out eight batters and yielded only three hits and three walks in seven strong innings. Despite Hernandez' dominance on the mound, the game was 0-0 entering the bottom of the seventh inning. The PawSox, thanks in part to an error, scored three runs in the inning, which turned out to be the only scoring in the game. PawSox outfielder Shannon Wilkerson drove in the first run of the game on an RBI-double. Wilkerson would come around to score on Ryan Roberts single, which also plated Dan Butler. Roberts, who batted leadoff, was the best individual performer going 2 for 4 with two RBI and a stolen base. 5/28 Cup of Coffee: After a stellar Memorial Day, the affiliates failed to walk away with a win on Tuesday. Pawtucket was unable to overcome an early hole while Salem was overwhelmed by Myrtle Beach's offense. Greenville played two, but was unable to come away with a victory in either part of their doubleheader. Portland's game against New Britain started with plenty of offense, but was suspended due to rain. The PawSox were unable to contain the Gwinnett Braves (ATL) offense, falling 8-3. Matt Barnes had his second straight rocky start, tossing 4 1/3 innings, allowing seven runs (six earned) on six hits and two walks, punching out six. The 23-year-old right-hander fell to 1-3 on the season, and now carries a 5.35 ERA through seven starts. John Ely continued to pitch well in relief, hurling 2 2/3 scoreless innings of relief, striking out four. Pawtucket found itself down 7-0 after five, and did not score until the seventh inning. The PawSox scored all three of their runs in the seventh on RBI singles from Shannon Wilkerson and Mike McCoy. Pawtucket actually outhit Gwinnett 7-6, however all seven hits were singles. Owens powered himself to SoxProspects.com Pitcher of the Week honors on the strength of 14 strikeouts while allowing a single earned run over 11 innings of work. His first start against Binghamton (NYM) on May 19 was a comparatively brief four inning affair wherein he allowed a run on two hits and four bases on balls while compiling eight of his strike outs and was saddled with the loss. 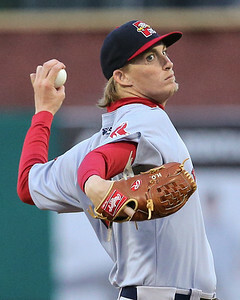 In his second outing of the week at New Hampshire (TOR) May 24, Owens worked seven shutout innings, allowing four hits and a walk and striking out six en route to the win. This is his second SoxProspects.com Pitcher of the Week award in 2014 having previously won for the period of April 3-6. 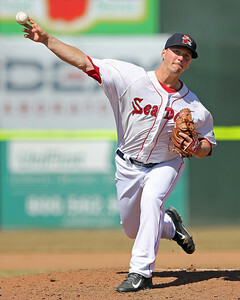 Owens is currently ranked second in the organization by SoxProspects.com. 5/27 Cup of Coffee: Memorial Day baseball was friendly to the Red Sox organization. A day after the minor league affiliates were swept and major league club continued its longest losing streak of the 21st Century, the tables were turned entirely. As the Red Sox broke out of their slide on Monday, their minor league teams swept away the competition. Portland prevailed behind a rehabbing Steven Wright, Pawtucket withstood a late rally to get back in the win column, Salem's bats helped to overcome some shaky defense, and every starter notched a hit for Greenville. Despite a late scare, Pawtucket was able to snap its seven-game losing streak with a 3-2 win over the Gwinnett Braves (ATL). 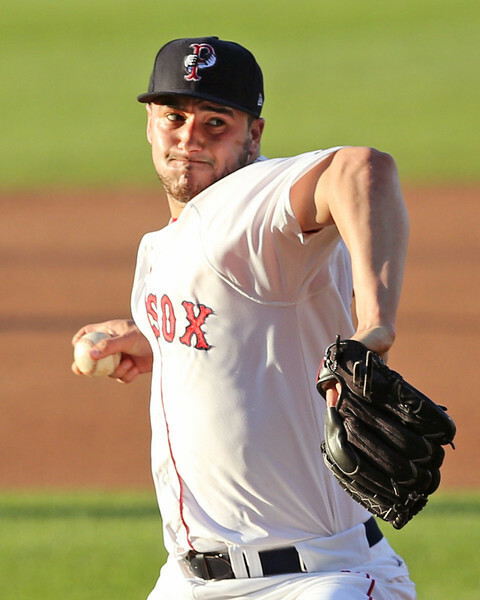 Anthony Ranaudo was the stopper for the PawSox, delivering 6 2/3 shutout innings to earn the win. He allowed only four hits, and struck out and walked four apiece. Ranaudo has given up only one run in 19 1/3 innings over his last three starts, and has allowed three or fewer runs in nine straight. Leading 3-0 in the ninth, Rich Hill allowed a pair of runs but struck out a pair to seal the win. Pawtucket's offense did all of their scoring in the fifth inning. After a Mike McCoy double broke a scoreless tie, Ryan Roberts ripped his first home run of the season. McCoy was 3 for 3, and his double was the only extra-base hit of the day for the PawSox. 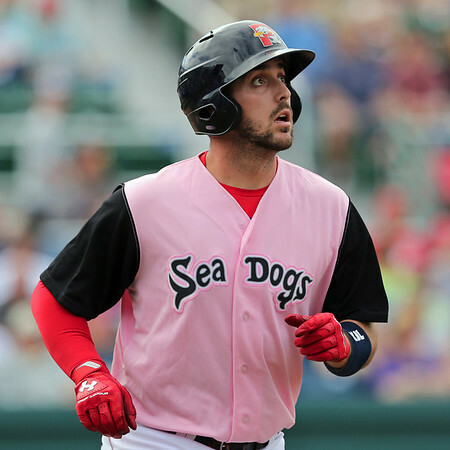 Travis Shaw made his Triple-A debut, playing first base and going 1 for 3 with a sixth-inning single. MANCHESTER, N.H. -- Things are changing for Mookie Betts. Both on the field and off, Betts has had to adjust to an evolving set of circumstances brought on by his breathtaking success to start the season. 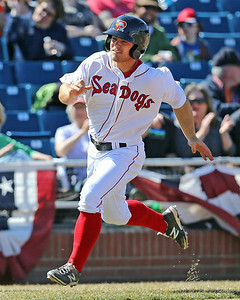 Betts, currently a member of the Double-A Portland Sea Dogs, had a breakout 2013 campaign, being named the Red Sox minor league offensive player of the year after hitting .314/.417/.506 across two levels of A-ball with 15 home runs and 38 steals. This year, he has taken that to another level. The 5-foot-8 Betts got on base in the first 35 games of the season, recording hits in all but one of those contests. His on-base streak, reaching back to last season, grew to 66 games, 71 including playoffs. He fell five games short of the minor league record of 71 regular-season games, set by two players Red Sox fans are familiar with: Kevin Youkilis and Kevin Millar. From the beginning of the season until the last game of the streak on May 15, Betts hit .401/.467/.619 with six home runs and 18 stolen bases, scoring 44 runs atop the Portland lineup. Entering Monday's games, he ranked among the minor league leaders in average (.366), runs (50), hits (68), total bases (107), doubles (17) and steals (22), and has been a standout in the field at second base. But since Dustin Pedroia signed his eight-year, $110 million extension last July, there was one nagging question that followed Betts’ gaudy numbers: How would he fit in Boston once he was ready to play in the majors? 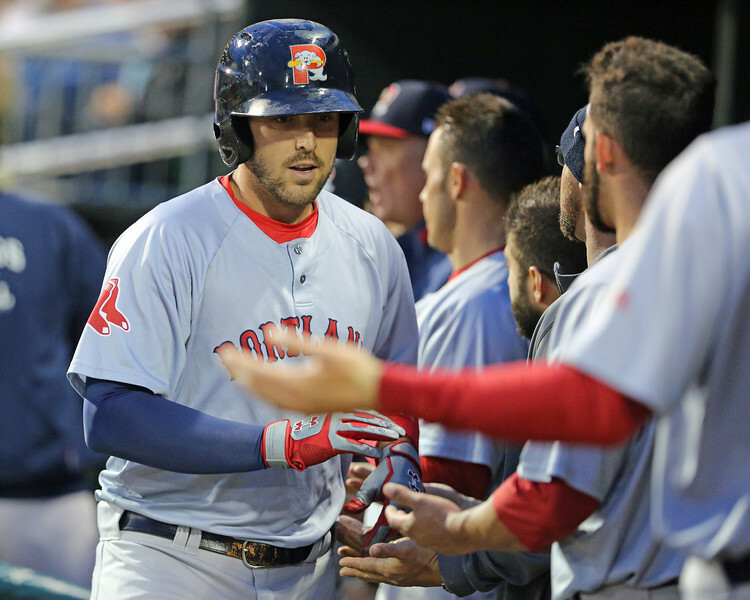 First baseman Travis Shaw has been promoted to Triple-A Pawtucket, reports Kevin Thomas of The Portland Press Herald. The move highlights a series of maneuvers the Red Sox organization made on Sunday. The team recalled first baseman/catcher Ryan Lavarnway from Pawtucket, and optioned reliever Alex Wilson after Sunday's game. Pitcher Steven Wright, on the 60-day disabled list with a sports hernia, will begin a rehab assignment with Double-A Portland. Shaw, 24, earned the promotion with a strong .305/.406/.548 line in his repeat engagement with the Eastern League. Shaw had appeared in 205 games for Portland since he was promoted from Salem in 2012. He struggled some with contact in 2013, as 117 strikeouts limited his overall line to .221/.342/.394, but he took a major step forward in that department this season, with only 23 strikeouts in 208 plate appearances. 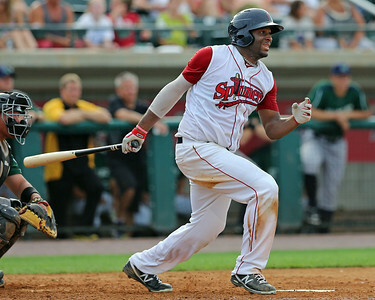 Shaw also showed a significant boost in power, as his 11 home runs and 37 RBI placed him third in the Eastern League. 5/26 Cup of Coffee: Little went well in the Boston organization on Sunday. As the major league club is mired in its worst losing streak in 20 years, the minor league affiliates were swept. Despite his best efforts, Brian Johnson (pictured, right, from yesterday's game at Northeast Delta Dental Stadium in Manchester) took his first Double-A loss as Portland fell in a pitcher's duel. Pawtucket failed to hold a six-run lead, while Salem and Greenville fell victim to five-run innings. Despite an 8-2 lead in the sixth inning, Pawtucket dropped a 10-9 decision to the Syracuse Chiefs (WAS). A two-run homer in the fourth by Corey Brown got the scoring started for the PawSox, as the ex-Chief went deep against his former team for the second straight night. Pawtucket then added two more in the fifth and four in the sixth to take what appeared to be a commanding lead. Shannon Wilkerson made his Triple-A debut and was 2 for 4 with a double. Dan Butler added a pair of doubles, and Carlos Rivero and Brandon Snyder added two hits apiece. 5/25 Cup of Coffee: On a night when the big league team lost in frustrating fashion, the affiliates earned a split. Portland and Greenville were on opposite sides of blowouts, while Salem won in extras. Pawtucket spoiled a fine start to take the loss. The bullpen failed to hold the lead, as the PawSox were downed by the Syracuse Chiefs (WAS), 4-1. Rubby De La Rosa was spectacular through six for Pawtucket. The righty allowed only four hits and two walks while striking out five. Jeremy Kehrt did not fair so well in relief, surrendering all four of Syracuse's runs while only managing to record one out in the seventh. Offensively, the PawSox had little luck as they picked up only six hits on the night, two off the bat of Ryan Roberts. Pawtucket's only run came thanks to a Corey Brown home run in the top half of the ninth inning. 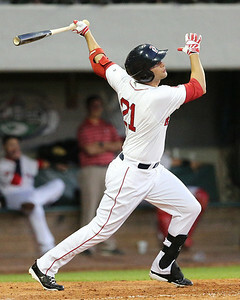 Garin Cecchini, Ryan Lavarnway and Carlos Rivero all notched one hit apiece in the constest. 5/24 Cup of Coffee: Tuesday proved to be a fruitful day for most of the affiliates, with Portland, Salem, and Greenville all visiting the winner's circle. Pawtucket continued to struggle as they were shutout. Pawtucket's recent struggles continued as they dropped their fifth game in a row, 4-0, to the Syracuse Chiefs (WAS). Chris Hernandez labored through 2 2/3 innings, allowing three runs on five hits and three walks to drop to 1-5 on the season. Hernandez filled in for scheduled starter Brandon Workman, who was scratched before the game, likely signaling a call to Boston. Rich Hill pitched well in relief, striking out five and not allowing a baserunner in 2 1/3 innings. The PawSox had a quiet night at the plate as Syracuse starter Aaron Laffey tossed a complete game shutout, allowing just four hits. Daniel Nava and Ryan Lavarnway were both 1 for 4 with a double in the loss. 5/23 Cup of Coffee: Mookie Betts was the star again on Thursday, reaching base five times and smacking a walk-off two-run triple. While Betts continued to pummel the Eastern League, the pitching performances last night were subpar, with Matt Barnes, Miguel Pena, and Pat Light all allowing four runs or more. Matt Barnes was roughed up for the first time all season, as the PawSox fell to the Syracuse Chiefs (WAS), 6-1. Barnes gave up six runs on eight hits in only three innings, walking three and striking out four. His ERA ballooned from 2.89 to 4.35, and he allowed two home runs. The trio of Dalier Hinojosa, Chris Resop, and Tommy Layne combined to keep the Chiefs off the board over the final five innings, but the Pawtucket offense was not able to hit its way back into the game. 5/22 Cup of Coffee: The only two affiliates in action Wednesday were Portland and Salem and both played doubleheaders. Portland swept both halves of its double dip while Salem split. In the first half of the doubleheader the Sea Dogs defeated the Birmingham Mets (NYM) 5-1 in a seven inning contest. The Sea Dogs jumped out to an early 3-1 lead after the first inning of play thanks to a three-run homer from third baseman Stefan Welch. Welch, who was 2 for 4 with 3 RBI, played third base and batted clean up. First baseman Travis Shaw also homered in the game, his ninth of the season. Portland starter Keith Couch (Pictured) was extremely sharp allowing only the lone first inning run in his complete game performance. Couch, who moved to 6-0 on the season, scattered nine hits and one walk while striking out two in the victory. He lowered his season ERA to 2.39. During the season we will be featuring videos here from the SoxProspects YouTube page. 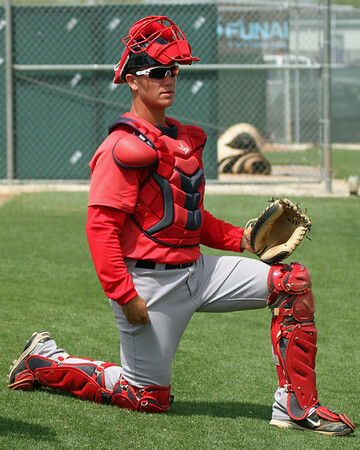 Today's video is of Pawtucket third baseman Garin Cecchini. In it, you can see the on-base machine working counts and taking swings this spring. Follow the link to the YouTube page to view many other prospect videos. 5/21 Cup of Coffee: Pitching was solid across all of the affiliates on Tuesday, but only Portland and Greenville were able to walk away with wins. Pawtucket and Salem's did not put up much fight at the plate, as the PawSox were shutout and the Red Sox were only able to push across a single run. Despite a solid start from Anthony Ranaudo, Pawtucket was shut down by the Scranton Wilkes-Barre RailRiders (NYY), falling 3-0. Ranaudo hurled 5 2/3 innings, allowing just one run on four hits and four walks, punching out seven. Rich Hill allowed two runs on three hits and a walk in 1 1/3 innings of relief. Alex Wilson continued to pitch well in relief, tossing two scoreless innings. The PawSox collected just six hits, two of which came from Brandon Snyder, who was 2 for 4 with two doubles. Pawtucket was 0 for 6 with runners in scoring position and left nine men on base in the loss. 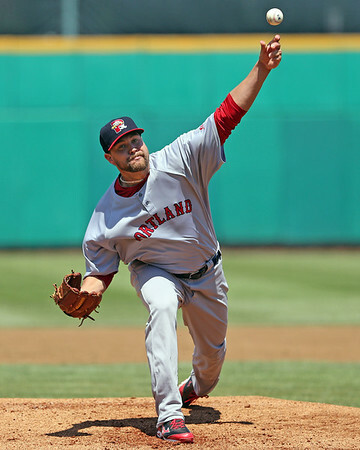 A week after getting roughed up in his piggy-back start against Carolina (CLE), Haley got a shot at redemption May 16 at Carolina, working seven shutout innings and allowing only four baserunners to reach, striking out nine opposing batters and earning the win en route to SoxProspects.com Pitcher of the Week honors. Haley, 22, was a sixth-round pick in 2012. 5/20 Cup of Coffee: It was a tough day on the farm on Monday, as the organization's only win came in the only game that wasn't started by a top-10 prospect. Trey Ball was hit hard as Greenville fell, while Allen Webster and Henry Owens struggled with efficiency and control for Pawtucket and Portland. Mike McCarthy came through with a strong start and was boosted by good run support as the Sea Dogs were able to salvage a split of their doubleheader. Pawtucket fell 5-3 in 10 innings to the Scranton Wilkes-Barre RailRiders (NYY) after a pitchers' duel turned into a battle of bullpens. Allen Webster allowed just one run on three hits in five innings while striking out four. However he also walked three, hit a batter, and uncorked a wild pitch, and was already at 99 pitches when he was lifted to start the sixth for Tommy Layne. Layne allowed just one hit in two shutout innings, and departed with the PawSox up 3-1, but they could not nail down the win. Drake Britton was greeted with a single followed by a game-tying home run. He also walked two in his only inning of work. Chris Hernandez shut own the RailRiders in the ninth, but was touched for a pair of runs in the tenth inning. With the loss, Hernandez falls to a record of 1-4 on the year. Ryan Roberts led the way at the plate, going 3 for 5 with a double, the PawSox' only extra-base hit of the night. 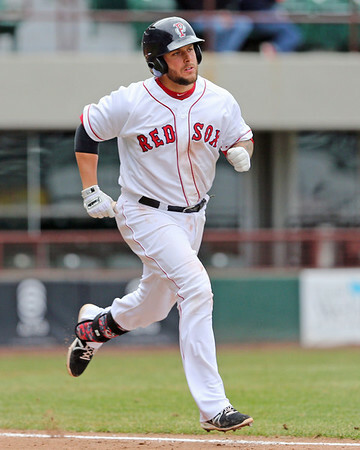 Ryan Lavarnway and Corey Brown had two hits apiece, and Garin Cecchini was 1 for 4 with a run scored and stolen base. Mookie Betts (pictured, right) had been on fire to begin the year, and through Friday he had reached base in 71 consecutive games including the playoffs, which tied the minor league record held by Kevin Youkilis and Kevin Millar. The streak finally came to an end on Saturday when he went 0 for 4. Over the 71 games Betts hit .404/.478/.621. 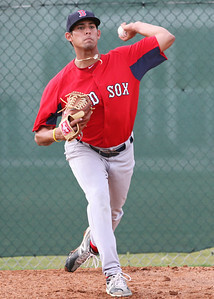 Betts also made news this weekend when he started his first professional game in center field on Sunday. Talk of trying Betts in center field has been talked about for a long time since second base is blocked at the major league level for the foreseeable future by Dustin Pedroia. 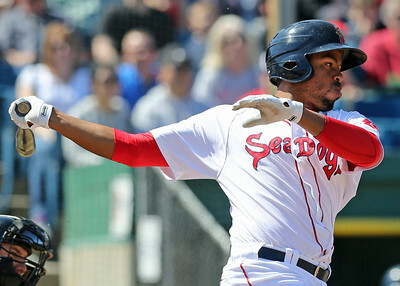 SoxProspects.com Staff Writer Jim Crowell covers this in this morning's Cup of Coffee and wonders if Betts might see more games in center field as he works on his positional flexibility as he gets closer to major league ready. 5/19 Cup of Coffee: There were solid pitching performances at every level, both in the starting rotation and out of the bullpen, but the four affiliates combined to score only 10 runs, as they went 1-3 on the day. The big story of the day was Mookie Betts making his debut in center field, where he performed well in his limited opportunities, helping Mike Augliera (pictured) pick up his third win of the season. Pawtucket got an up-and-down pitching performance from Rubby De La Rosa, and fell to the Scranton/Wilkes-Barre RailRiders (NYY), 3-2. De La Rosa allowed nine hits in five innings, but was able to limit the damage by striking out eight and walking only one. Despite the high hit total, it was an encouraging outing for De La Rosa, who walked less than three batters for the first time since April 22. 5/18 Cup of Coffee: There was offense aplenty Saturday night, as three teams took home the win. Portland and Salem won close ones, while Pawtucket managed to get ahead early. Greenville took home the only loss, losing a blow-out by eight runs. The PawSox used some big hits and decent pitching to down the Scranton/Wilkes-Barre RailRiders (NYY), 6-3. Brandon Workman got the start for Pawtucket and kept the RailRiders off the board until the sixth. Workman surrendered a solo home run in the sixth and a two-run shot in the seventh. Workman ended the night after 6 2/3 innings pitched, giving up just the three runs on six hits and two walks while striking out six. Alex Wilson pitched the ninth, striking out two en route to his fifth save of the season. The PawSox tacked on four runs in the third and another two in the eighth. Brandon Snyder was at the forefront of Pawtucket's offense as he hit a three-run double in the third and a solo home run in the eighth. Snyder went 3 for 4, with a double and a home run as well as four RBI. Seven of the nine PawSox starters had a hit, eight managed to reach base at least once in the contest as Pawtucket tacked up 11 hits against the RailRiders. 5/17 Cup of Coffee: The Salem pitching staff stole the show on Friday, as they did not allow a run in either game of the doubleheader. Corey Littrell and Justin Haley (pictured) pitched 13 of the 14 shutout innings as they each continued their great starts to the season. Meanwhile, Pawtucket suffered a heartbreaking loss, and Mookie Betts kept his streak alive. Drake Britton could not close out the win, as the Indianapolis Indians (PIT) walked off with a 6-5 victory over the PawSox. Matt Barnes had a solid start, allowing three runs in five innings, despite walking only one batter and striking out six. The PawSox were up 5-3 heading to the bottom of the ninth, but Britton gave up five hits, including a walk-off single with two outs. This was his first blown save of the year. Brandon Snyder led the way on offense, going 2 for 3 with a home run and a walk, and Alex Hassan went 1 for 2 with a double and two walks. The PawSox took the lead in the top of eighth, when Daniel Nava hit a two-run inside-the-park home run, but they were not able to hold on, falling to 24-19 on the season. 5/16 Cup of Coffee: The only baseball that the Red Sox organization got in on Thursday was during daylight. 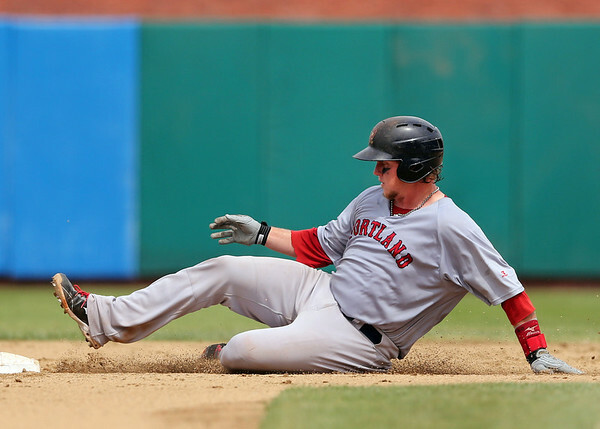 While the major league club lost its matinee, Pawtucket and Portland were more successful. A trio of PawSox arms combined for a five-hit shutout, and the Sea Dogs went on a 20-hit rampage in their win. Both Salem and Greenville were rained out. After losses in the first two games of the series, Pawtucket got back into the win column with a 4-0 shutout of the Indianapolis Indians (PIT). Anthony Ranaudo (pictured) was dominant in his longest outing to date in 2014. The 6-foot-7 righty scattered five hits across seven scoreless frames, walking one and striking out five. With that performance, Ranaudo slashed his ERA from 4.08 to 3.47. Rich Hill and Alex Wilson finished off the shutout, striking out a batter apiece to combine for two hitless innings. 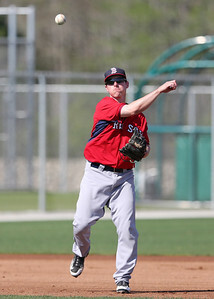 Bryce Brentz provided most of the Pawtucket offense. The right fielder was 3 for 4 with two doubles and a solo home run. Brentz either drove in or scored each of the PawSox runs. Daniel Nava was 1 for 3 with a walk and run scored, and has now hit in seven straight games. Garin Cecchini and Dan Butler added 2-for-4 afternoons. The Red Sox have announced that Trey Ball (pictured, right) has been placed on the disabled list retroactive to May 10th, and Daniel McGrath will start for Greenville and make his season debut tonight. According to Alex Speier of WEEI.com, Ball is suffering from a case of strep throat. McGrath, an Australian native, had been in extended spring training after being slowed this spring by tonsillitis. 2013 was the first professional season for the left-hander, and he started in the Gulf Coast League before being promoted to Lowell after 20 innings. Over 33 2/3 innings for Lowell, McGrath had a 4.86 ERA and 1.26 WHIP with 35 strikeouts to 12 walks. Still only 19, McGrath is a work in progress, and time will tell if he is able to add some velocity to his fastball, which currently sits in the 86-89 mph range. During the season we will be featuring videos here from the SoxProspects YouTube page. 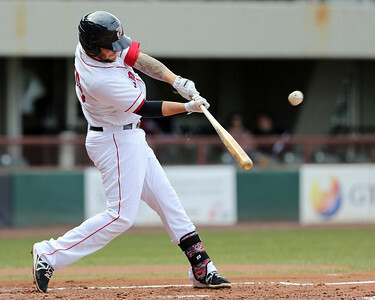 Today's video is of the ascending catching prospect Blake Swihart. In it, you can see the potential Red Sox catcher of the future taking swings from both sides of the plate, and donning the tools of ignorance behind the dish. Follow the link to the YouTube page to view many other prospect videos. 5/13 Cup of Coffee: It took all of Pawtucket's 15 hits and nine runs to eke out the organization's only win on Monday. Salem fell in a devastating walk-off, and Greenville was roughed up. After getting off to a 9-3 advantage, Pawtucket held on for a 9-8 win over the Louisville Bats (CIN). The PawSox lineup had 15 hits, and four players had three apiece. Brandon Snyder (pictured), hit a game-tying homer in the third as part of a 3-for-5 effort. All three of Ryan Roberts hits went for extra bases, as the second baseman had two doubles and a triple. Alex Hassan and Ryan Lavarnway were both 3 for 4 with a walk and two runs driven in. 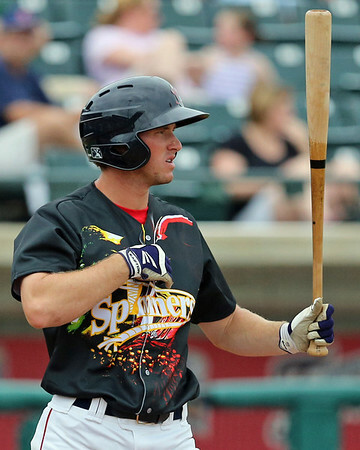 Corey Brown, who got off to a very difficult start in 2014, hit a fifth-inning grand slam. It was Brown's third home run in four games, and he has driven in nine runs in that span, more than doubling his season total in both categories. Brandon Workman picked up the win despite allowing 10 hits and four runs in his five innings. He struck out two and walked one. Tommy Layne gave up a run on four hits in two innings, striking out three without walking a batter. The Bats rallied for three runs off Chris Resop in the eighth to come within one. Alex Wilson got the heart-attack save, walking two to put the winning run on base but ultimately escaping with the win intact. The system's stable of arms was the topic du jour last week among local media and scouts, due in part to strong outings from notable players. Among them is Pawtucket right-hander Brandon Workman (pictured), who is toiling in his conversion from a reliever to a starter. 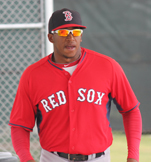 The 25-year-old's recent results -- including a May 7 outing in which he surrendered four solo home runs -- belies his progress, according to SoxProspects.com Managing Editor Matt Huegel. 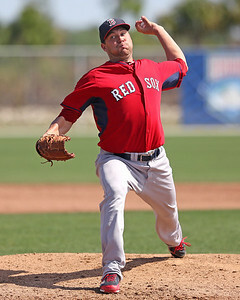 For more on Workman check out Chaz Fiorino of SoxProspects.com's The Write-Up. Fiorino also offers tidbits on right-hander Rubby De La Rosa, who has experienced mixed results following a strong April. Fiorino details how De La Rosa needs to slow down and be more consistent in his delivery, which will contribute to better command. Cup of Coffee: Greenville picks up lone win as affiliates struggle. 5/11 Cup of Coffee: The affiliates stumbled to a 1-3 finish, thanks largely to shaky pitching performances. There were few bright spots offensively, though Carlos Rivero, Reed Gragnani and Kendrick Perkins (pictured) all managed multi-hit games. The mighty Mookie Betts got the the night off, further dimming the offensive output. 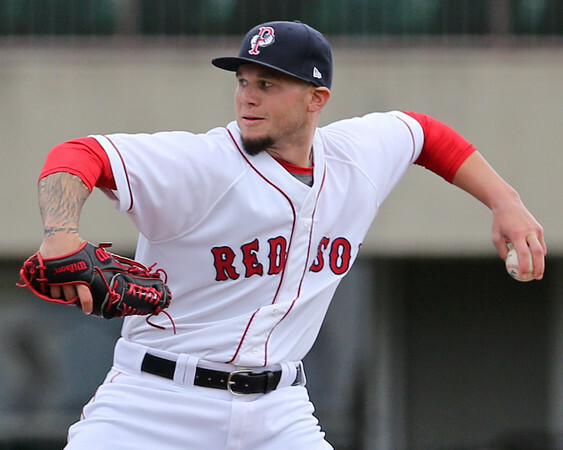 The PawSox surrendered their lead in the eighth, falling to the Louisville Bats (CIN), 7-4. Anthony Ranaudo pitched well enough, giving up three runs on four hits and three walks while striking out three in six innings of work. To be fair to Ranaudo, after a three-run second inning, the righty allowed no runs on only one hit in his last four innings of work. Chris Hernandez picked up the loss in relief as he allowed two runs in only 11/3 innings pitched. Likewise, Alex Wilson came on in relief and gave up another two runs before getting the final two outs of the eighth. Bryce Brentz snapped an 0 for 26 slump in the fourth, as he lofted a three-run home run to tie the ballgame at three. The next inning, Alex Hassan singled to bring home the go-ahead run and put the PawSox up 4-3. As a team the PawSox managed only five hits in the contest, though they did walk a collective six times. 5/10 Cup of Coffee: The affiliates went 3-1 on Friday, led by strong pitching from Allen Webster and Brian Johnson (pictured). Johnson tied a career high with eight strikeouts, while Webster allowed only one walk as he contributed to a shutout. Trey Ball was not as sharp, lasting only 3 2/3 innings as he battled his control throughout the start. The offense was relatively quiet throughout the system, but Mookie Betts still managed to get on base twice. 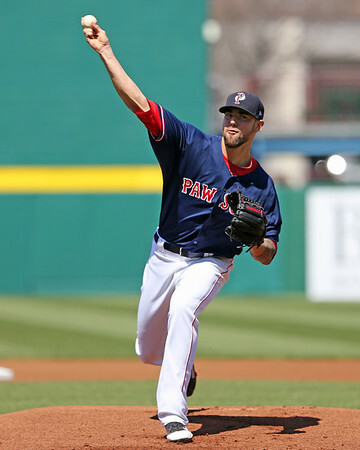 Four pitchers combined on a shutout for the PawSox, as they defeated the Louisville Bats (CIN), 5-0. Allen Webster went the first five innings, giving up six hits and one walk while striking out three. He threw 56 of his 87 pitches for strikes, and in his last 24 innings he has only surrendered four runs. The trio of Tommy Layne, Dalier Hinojosa, and Chris Resop combined to throw the final four innings, allowing only one hit and striking out seven. During the season we will be featuring videos here from the SoxProspects YouTube page. New videos from spring training will be going up on YouTube every Wednesday until the end of May. Today's video is of the new top prospect Mookie Betts. In it, you can get a glimpse of the second baseman's great potential. Follow the link to the YouTube page to view many other prospect videos, including one from last spring of Betts hitting a home run just before his breakout season. 5/7 Cup of Coffee: Portland was the lone victor of the evening as Pawtucket's offense was quiet and Salem's bullpen blew a late lead. Pawtucket's offense had a difficult time with runners on base as they fell to the Toledo Mud Hens (DET), 4-1. Matt Barnes pitched well over his six innings of work, allowing two runs on three hits and four walks, punching out four. Drake Britton and Tommy Layne each allowed a run in their lone innings of relief. The PawSox only run of the contest came in the seventh on a sacrifice fly from Alex Hassan. Pawtucket was just 1 for 11 with runners in scoring position and mustered just six hits on the evening. Garin Cecchini and Corey Brown were each 2 for 4 to lead the PawSox offense. This week's SoxProspects.com Player of the Week honoree reached base prolifically, arriving safely in 13 times in 21 plate appearances, recording a hit in each game and taking a base-on-balls in all but one, and even flashed a little extra-base power with a double and two triples. 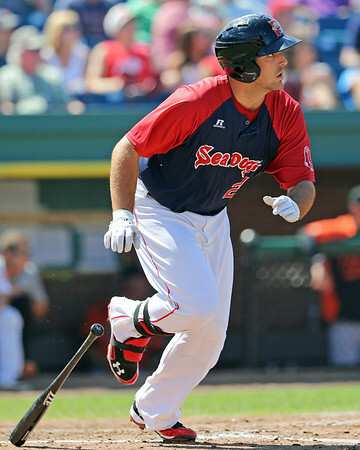 Gragnani currently leads Salem in batting average (.400), on-base percentage (.490) and slugging (.538). PORTLAND, Maine -- Matt Spring stepped into the box for his round of batting practice, his low-maintenance routine — a helmet adjustment here, a half-step there — preceding each cut through the cool spring air. On the last pitch, a mighty swing sent the ball soaring so high over the iconic 37-foot wall in left field it might have cleared a structure twice as high. His target is the Maine Monster, not the Green Monster, and this is Portland, not Boston. The grass is not green and luscious, but flat and mostly dead after a brutal New England winter. The players are not millionaires, but youngsters trying to make a name for themselves or veterans holding on to their playing careers, or something in between. Spring talks a lot about “the world” — about how it’s not fair, about how you have to deal with what it gives you. And through a certain lens that’s easy for him to say. Among the 7 billion-plus people who live here, Spring is downright extraordinary. Few people can hit a baseball 400 feet or throw one 127 feet, 3 3/8 inches in under two seconds, and even fewer can say they play ball for a living. 5/6 Cup of Coffee: It was a big day down on the farm, as Boston's affiliates swept their slate of games backed by strong pitching and some big offensive performances. Greenville and Portland both won in blowouts, Salem walked off after a pitcher's duel, and Pawtucket held on after opening an early cushion. After getting out to an early 6-0 lead, Pawtucket withstood a rally to beat the Toledo Mud Hens (DET), 6-4. 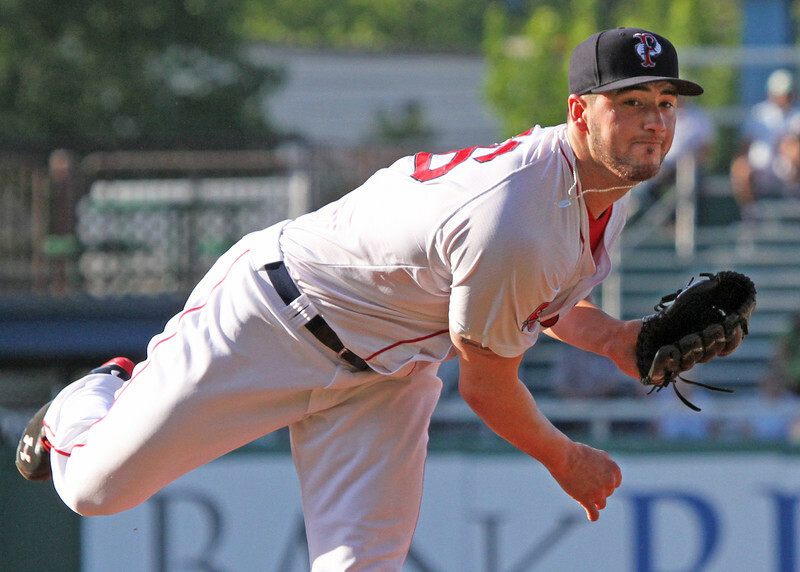 Anthony Ranaudo was on the mound to kick off the four-game set at McCoy. The big right-hander was dealing a shutout through five innings but ran into trouble in the sixth when he began the inning with a walk, single, RBI double, and walk without retiring a batter. He was lifted for Rich Hill, who walked in a pair of the inherited runs, giving Ranaudo a final line of three runs on three hits in five plus. Dalier Hinojosa struck out one in two perfect innings to record his first professional save. Ryan Roberts was 2 for 4 with a double, and Alex Hassan drove in two runs as part of his 2-for-4 night. Brock Holt also had a pair of hits, ending his 0-for-10 skid. 5/5 Cup of Coffee: Allen Webster, Mike McCarthy, and Jamie Callahan all pitched well in victories, Henry Ramos (pictured) and Tzu-Wei Lin each had four hits, and Daniel Nava drove in the game-winning run for the PawSox. 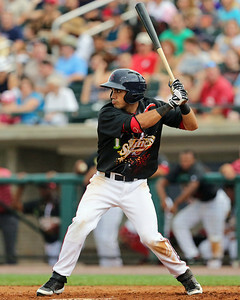 Mookie Betts extended his on-base streak, and Greenville scored double-digit runs for the second time in seven games. 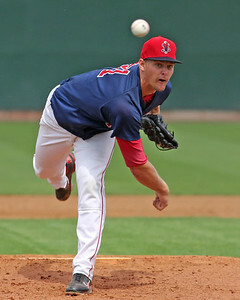 Behind a third straight quality start from Allen Webster, the PawSox beat the Indianapolis Indians (PIT), 3-2. Webster worked a season-high 6 2/3 innings, allowing two runs on seven hits, walking two and striking out six. Over his last three starts, Webster has allowed four runs in 19 innings (1.87 ERA), walking five and striking out 12. Alex Wilson picked up his third save by firing 1 2/3 perfect innings, striking out three. 5/4 Cup of Coffee: The Portland Sea Dogs were the only affiliate to pick up a win, though they also had a loss. Neither Pawtucket, Greenville or Salem were able to pick up their starting pitchers as all three took a loss. Despite a late comeback attempt, Pawtucket fell to the Indianapolis Indians (PIT), 4-3. Rubby de la Rosa pitched well through the first five innings but failed to record an out in the sixth after allowing a lead off double and a walk. De la Rosa ended his day after five innings and allowed two runs on four hits and five walks while striking out four. Drake Britton came on in relief and allowed both of his inherited runners to score and allowed another two runs to cross the plate in the seventh. The PawSox were held scoreless until the seventh when Brandon Snyder hit his team-high fifth home run to put Pawtucket on the board. Dan Butler hit a two-run single in the ninth to bring the PawSox within one but the offense was unable to do any more damage. Since July 20, 2012, the SoxProspects.com top prospect has stayed the same, and there was no debate necessary. 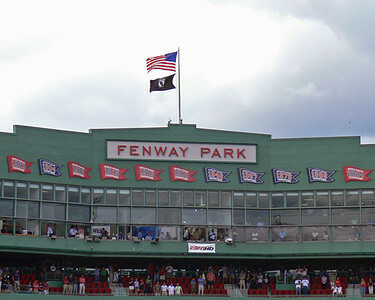 With the graduation of Xander Bogaerts on Friday, however, that has changed and there was interesting discussion among the site’s management about who should be the new top prospect. Below is inside-look at that debate which included Editor-in-Chief Mike Andrews, Executive Editor Chris Hatfield, Managing Editor Matt Huegel, and Director of Scouting Ian Cundall. The four main candidates considered for the top spot were: Henry Owens, Mookie Betts, Garin Cecchini, and Blake Swihart. While contemplating it for a good while, I chose Betts (pictured, right) over Owens because of Betts’ ridiculous consistency for the past 13 months, in four different leagues, all playing above his age level. I’ve also seen him quite a few times in that stretch, whether live or on MiLB.tv. It's already been established that he has a great plate approach and plays plus defense, and beyond the scouting the stats speak for themselves on offense. He really barrels up on the ball and laces it to the gaps. Betts has also been pesky on the basepaths over and above just stealing a lot of bases -- he's reminiscent of Jacoby Ellsbury in that vein. While I also see big things for Owens, his command and control have been too inconsistent. I do think he’ll add some velocity and I love his secondary stuff, but without some refinement around the edges, the whole package will not fool advanced hitters as much once there is a book on him. That said, I see the possibility for that refinement and I still see Owens as a potential #2 or #3. 5/2 Cup of Coffee: The calendar turned to May, and while April's Player of the Month was rained out with the rest of his Portland teammates, his runner up had a big game to lead Greenville. Salem came from behind with an eighth-inning rally, while Pawtucket dropped a rain-shortened contest. In a game called by rain after seven innings, Pawtucket to the Indianapolis Indians (PIT), 3-2. Matt Barnes was strong in his second start of the year, allowing a run on only two hits in five innings, striking out six and walking a pair. Reliever Dalier Hinojosa surrendered what proved to be the decisive blow, a two-run homer in the sixth inning. The Pawtucket offense managed only three hits. 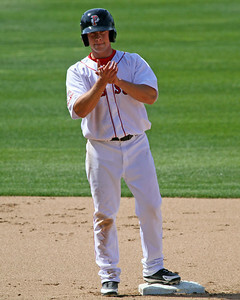 Daniel Nava was 1 for 3 and has hit safely in five of the six games since joining the PawSox, going 7 for 21. Ryan Lavarnway and Ryan Roberts both went 1 for 3 with a double, while Bryce Brentz was 0 for 3, ending his hitting streak at seven games. 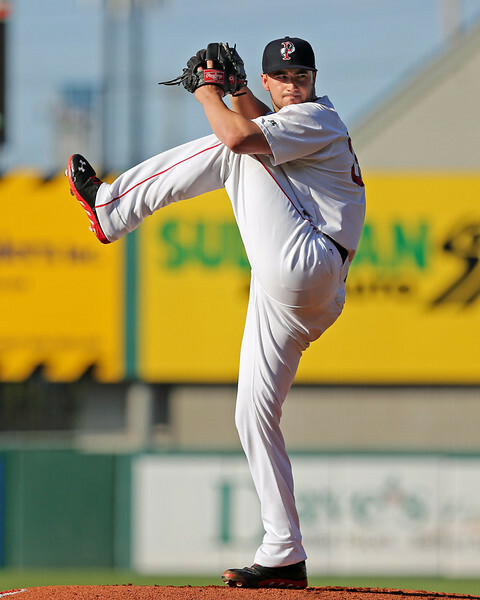 SoxProspects.com has confirmed through sources that at least two pitchers in the system are receiving promotions. 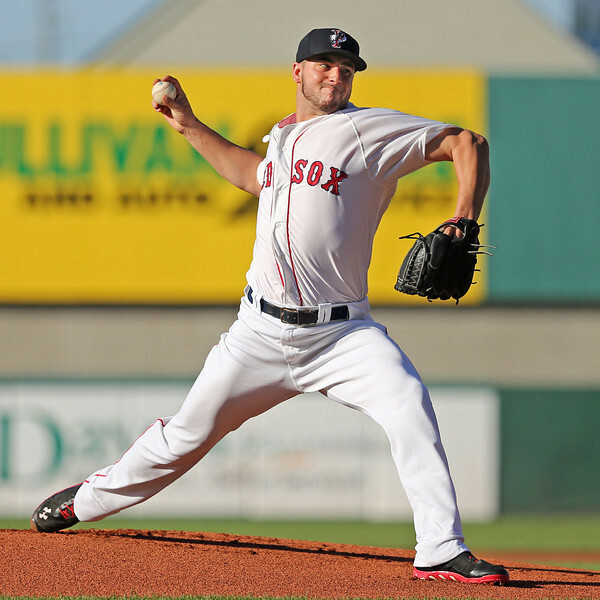 After a strong start to his season, 2012 first-round pick Brian Johnson has been promoted to Double-A Portland. Meanwhile, right-hander Ty Buttrey (pictured, left) has joined the Low A Greenville Drive, and will make his season debut on Friday. UPDATE: We can also now confirm that left-hander Cody Kukuk will be promoted to High A Salem as well. 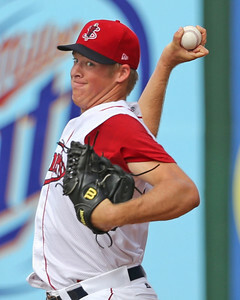 Buttrey was Boston's fourth-round pick in the 2012 draft as a high schooler out of North Carolina. He received an over-slot $1.3-million signing bonus to forego a commitment to pitch at Arkansas. After making four short appearances in the Gulf Coast League that season, he made what was effectively his professional debut last season with the Lowell Spinners, putting up a 2.21 ERA over 61 innings in 13 starts, striking out 35 batters and walking 21. Buttrey was brought along slowly in spring training this year, as he was just starting to throw to hitters as of late March.